Base R provides a nice way of visualizing relationships among more than two variables. If you add price into the mix and you want to show all the pairwise relationships among MPG-city, price, and horsepower, you’d need multiple scatter plots. R can plot them all together in a matrix, as the figure shows. 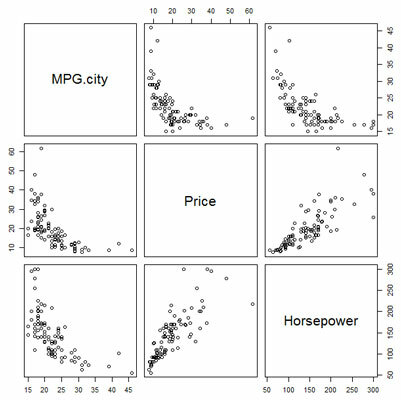 Multiple scatter plots for the relationships among MPG-city, price, and horsepower. The names of the variables are in the cells of the main diagonal. Each off-diagonal cell shows the scatter plot for its row variable (on the y-axis) and its column variable (on the x-axis). For example, the scatter plot in the first row, second column shows MPG-city on the y-axis and price on the x-axis. In the second row, first column, the axes are reversed: MPG city is on the x-axis, and price is on the y-axis. The R function for plotting this matrix is pairs(). To calculate the coordinates for all scatter plots, this function works with numerical columns from a matrix or a data frame. This capability isn’t limited to three variables, nor to continuous ones. To see what happens with a different type of variable, add Cylinders to the vector for select and then use the pairs() function on cars.subset. With the arguments laid out as in either of the two preceding code examples, plot() works exactly like boxplot().